March 19, 2016 March 20, 2016 ~ Trevis Dampier Sr. So it’s lunch time and I am in the mood for something hearty. Nothing succeeds these checkboxes but a fat juicy sandwich! My wife searches and finds a popular joint about 5 minutes away. We arrive to a long of people with drooling mouths and twitching fingers, ready to get their hands on The Sandwich Spot experience. They have all kinds of unique names for all of the sandwiches like The Tres Amigos, The Big Saucy and even The HogFather. I ordered The Rockin Reuben which is described as Hot Pastrami,Sourkraut,Swiss Cheese, with 1000 Island dressing. The other awesome news is that they had a special on corned beef since it was the day after St. Patrick’s Day so they gave me half and half. I take a seat and grab this masterpiece for the first bite.. 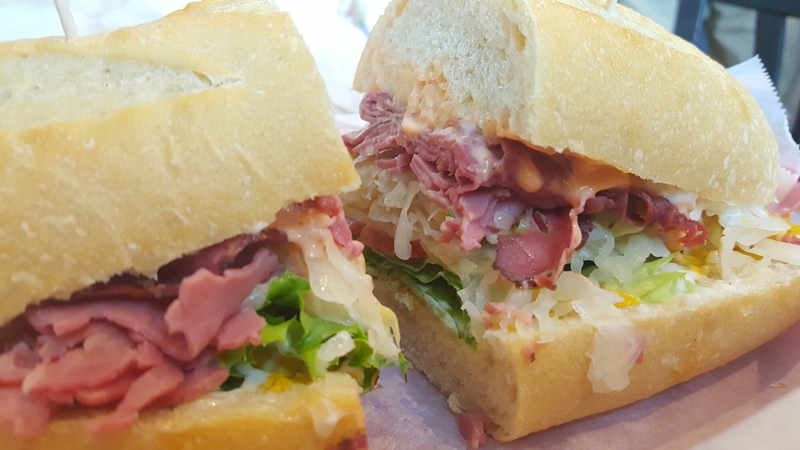 The pastrami and corned beef has a volcano eruption flavor that bursts in my mouth! The combination of the thousand island and saurkrawt just make this the perfect combo that cannot be compromised. My adrenaline kicks in and now I’m into lion attack mode. Moaning and biting with full force! Sauce on the sides of my face like fresh blood from my hunted kill. Bite after bite..Moan after moan. . Nothing but true live action eating! Great job The Sandwich Spot! < Previous Exquisite Dining near the Sea over at 333! Next > We Welcome Good Friday in Remembrance of Him!